The Start Menu is a staple of the Windows experience and should be streamlined, efficient, and unmolested by the greater world beyond the operating system and programs it serves as a portal to. 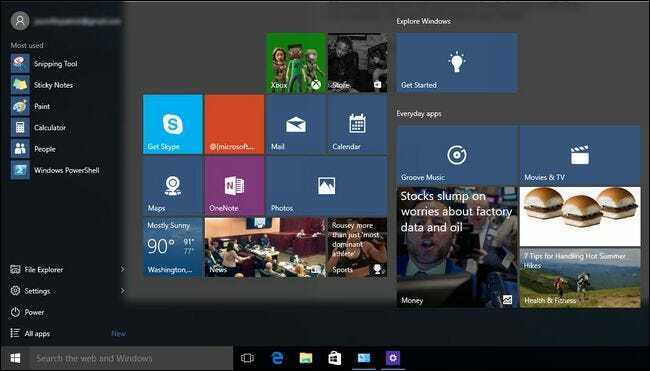 Microsoft brought the Start Menu back to the forefront in Windows 10 but they spoiled it in the process. It’s always popular to rant and rave about changes in operating systems when major iterations are released to the public. For the most part we’ve been around the upgrade block enough times that we’re largely unphased by the hassle of learning a new shortcut here or there, waiting for manufacturers to release updated drivers, and the other hiccups and bumps that come with millions of computers all shifting over to a new and updated operating system. Perhaps we’ve grown set in our ways or weary of change, but the roaring return of the Start Menu to the forefront in Windows 10 has left us grumbling and scowling more than any big Windows change has in a long, long time. To understand exactly why we’re so thoroughly displeased with the new Windows 10 Start Menu (even if you don’t agree with our scorn) take a stroll with us through the history of the Start Menu, where the Windows 10 Start Menu breaks the sacred rules of OS interface construction, and what should be done (and what you can do if what should be done never ends up actually coming to pass). The Start Menu has been with us a long, long, time now. In fact, if the Start Menu was a kid, it would be well through sophomore year of college at this point. It’s no wonder then, given that it has been with us so long that we have certain expectations of what the Start Menu is, what it should do, and we get more than a little miffed when it vanishes on us or fails to live up to our expectations. Before we dig into the Windows 10 Start Menu it would help to blow the dust off an old installation disk or two and stroll down Start Menu memory lane. In the earliest versions of Windows users didn’t have a Start Menu. Instead they had the Program Manager which was just a nested folder system of shortcuts to user-installed apps, system applications, and system functions. It wasn’t particularly elegant or speedy to use but computing wasn’t exactly moving at breakneck speeds back in the days of 386 processors and we all managed to get by. With the huge improvements ushered in by Windows 95 came a new way to organize and launch our applications: the first humble Start Menu. We can consider this the first generation of the menu system. It was simple and largely just a reorganization and enhancement of the folder system with quick access to a find command, the run dialogue, and other system functions but it was both great for its time and the start of a decades long user-interface affair between millions of Windows users and what would become the expected way to do business in the Windows environment. Generation Two: They Love It! They Really Love It! 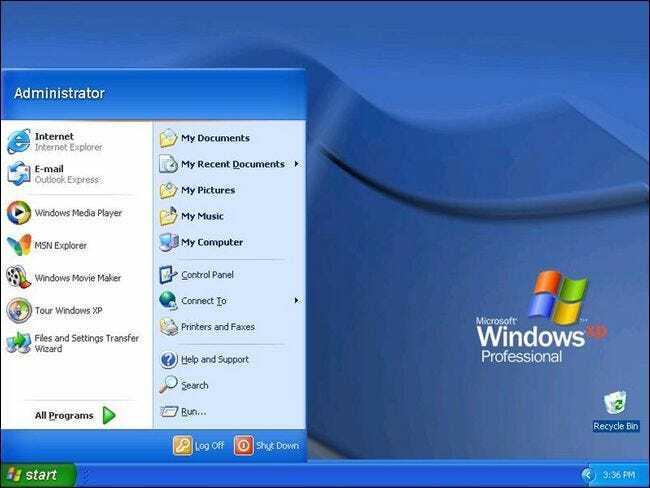 Along came Windows XP and the first major change to the Start Menu: generation two of the Start Menu system featured dual columns. Try as we might to cast our mind back through the haze of tech-conversations-past we can’t remember anyone getting too bent out of shape over the change. The Start Menu pretty much functioned exactly the same but now had an extra column to the right of the apps list that gave you quick access to My Computer, the local Network, My Documents and other personal-media folders like Pictures and Music, and of course a shortcut right to the Control Panel. Windows Vista and Windows 7 kept the basic framework and improved upon it. 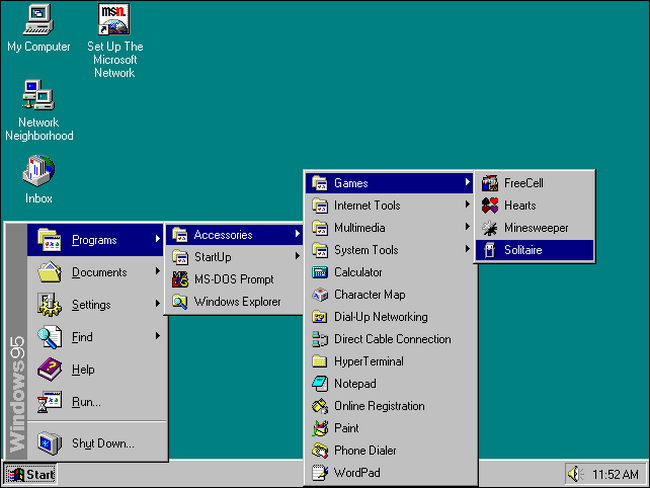 The Start Menu in Vista, for example, introduced the sliding program selection system so that expanding-trees of programs wouldn’t expand from the left hand side of the menu and obscure the rest of the Start Menu. At this point the Start Menu had become more polished, a little more flexible, but overall if somebody returned from the jungle after ten years away from civilization and you showed them a Windows 7 Start Menu they’d immediately understand they were looking at a very shiny and semi-transparent version of the Windows 95 Start Menu they recalled from the Clinton years. Generation Three: What The Hell Is This? In 2012 Microsoft rolled out Windows 8, the successor to the wildly popular (and widely adopted) Windows 7. It didn’t matter that Windows 8 offered a host of under-the-hood improvements. It didn’t matter that it ran pretty darn well on old and new machines alike. It didn’t matter that Windows 8 was the most secure version of Windows to date. To say the third generation of the Start Menu was received poorly would be an understatement of enormous proportions. After investing nearly two decades in not just getting users to like the Start Menu but getting them to love the Start Menu and see it as the nexus of their interaction with their Windows PC, Microsoft pulled the proverbial rug out from beneath its user base by swapping out the familiar Start Menu system with something totally new. The Windows 8 tile-based Metro user interface and the “Start Screen” looked like something that would be better suited for a tablet than a computer monitor (spoiler alert: because that’s what it was designed for). To add insult to injury, even if you were on a desktop machine without a touch screen you ended up booted into a silly tile system without a desktop in sight. Nobody appreciated it. Even if you kept abreast of tech news, even if you got the whole concept Microsoft was going for (a unified menu system across both their desktop PCs and the tablet market they were trying to invest themselves in), even if you considered yourself an easy going person that couldn’t be riled by a user interface change (no matter how big an abortion of good design it was), you just couldn’t bring yourself to like the Start Screen. The disdain that people had for Windows 8 and the whole Start Screen debacle made the fallout over Windows Vista look like a joke in comparison. If you don’t have a sense of how much people love the Start Menu yet, then consider this. Like Windows 8 the release of Windows 10 ushered in a pile of improvements, increased efficiencies, better security, and all manner of things you’d expect from a sweeping operating system upgrade. But outside of the tech press nobody is talking about all that. Everyone is talking about how the Start Menu is back and the desktop is alive again. While the Windows desktop is back at the forefront again (and it looks just the way we all remember it) the same can’t be said for the Start Menu, however. Once Microsoft got it in their head that we liked tiles, we liked things that blink and move and update us with real-time information, and bigger-was-better as far as menus were concerned, it was all over. 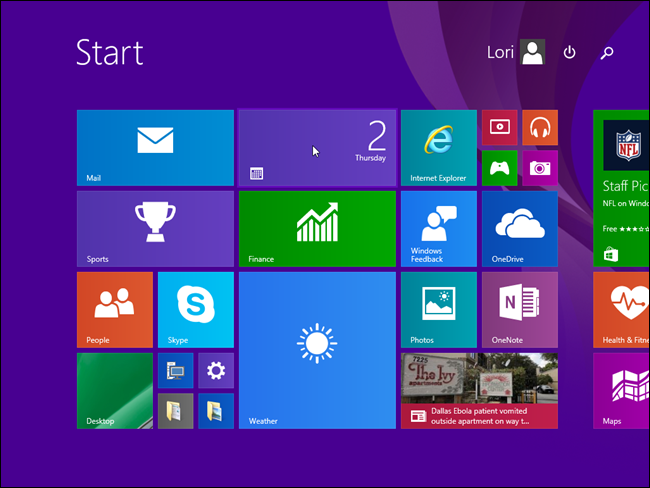 Despite the massive backlash against both the removal of the Start Menu in Windows 8 and the hybridized version of it that appeared in Windows 8.1, the Windows 10 Start Menu is, despite the claim that it was built from the ground up to be brand new, uncomfortably like the tiled-monstrosity we had all hoped to leave behind in Windows 8. While so many people are sitting back and exclaiming, “The Start Menu is back!”, thrilled to have escaped the hell that was the Start Screen, we find ourselves shaking our head at what the Start Menu has become. The title of this piece is “The Start Menu Should Be Sacred (But It’s Still a Disaster in Windows 10)” and we’re going to emphasize that opinion here. The Start Menu is the primary way in which millions upon millions of Windows users interact with their machine everyday and it should be, in so far as a design element of a computer system can be, a sacred space that is not mangled, shuffled around, rebuilt, weakened, or otherwise diluted. Improve the OS, improve the way apps load, improve the way memory is utilized, improve the security algorithms that keep us all from foolishing funding deposed Nigerian princes. But don’t screw the Start Menu up. The very greatest design sin in Windows 8 was the foolish presumption that desktop users would want a touch-style interface on their desktop PCs. It was worse than a misstep, it was a poorly calculated travesty. People who thought of Windows as the workhorse that underpinned their daily computer use suddenly saw Windows as this silly mobile OS with silly tiles and they had no idea where anything important actually was. It should have been the easiest decision Microsoft ever made to just chuck the tile system right in the trash and be done with it. They could have rolled out a beautiful Start Menu in Windows 10 that looked just like a supercharged version of the Start Menu we all knew (and missed) but instead they shoe-horned the Metro-style tile system in there. A touch-focused menu system is great for a tablet, so fine, Microsoft, use the tiles on all those Surface tablets. But enough with this crap on desktop PCs. We don’t want a blocky touch-centric interface on our distinctly non-touch-screen PCs. We don’t need a giant “Mail” icon bigger than a postage stamp. We don’t need multiple news tiles that are ten times bigger than the Start Button itself. We’re all using mice with very precise pointers and keyboards with very swift shortcuts and we don’t need a giant and heavy handed design interface that appeares intended for the ham-fisted and toddler-finger wielding. Although we’re clearly not in love with the Windows 10 Start Menu it does offer some flexibility and customization options, but sadly the most customizable element of the new Start Menu isn’t the actual parts they resurrected from the old Start Menu systems, you know the left-side apps list, but the tiles. Unlike in Windows 7 you can’t create custom lists within the left-column and you can’t pin apps. Oh, there’s an option to pin, to be sure, but instead of pinning the app to the more compact left-column list it instead pins the app as a giant ugly tile on the right-hand side. If you’re on the right-hand side, however, you can make new groups, rearrange and even remove tiles, and do all sorts of little customizations. Behold the power of pinning! Tiny icons become huge tiles. The absurdity of this is that Microsoft clearly invested a lot of time in making the thing that people liked the least the most customizable. Why bring back this retro-style Start Menu only to make the old-school (and beloved) parts of the menu rigid and inflexible and the thing that people dislike the most packed with customizations? This is it. Everything else up to this point could perhaps be forgiven. There is possibly enough penance to be paid in the world to pay for a crappy touch interface or unnecessarily turning simple app entries into big ugly ties. Do you know what there isn’t enough penance in the world to fix? Letting the outside world leak into the Start Menu. When we floated the idea of this article in a meeting, this was the point of anger that sealed the deal and pushed the article toward publication. The Start Menu should be sacred. It should be the place where we find the applications we want to open. It should be the place where we search for files on our computer. It should be the place where, like a well laid out physical workspace, we have all the tools we need to work efficiently and without distractions or intrusions. Let’s look at that screenshot of the Windows 10 Start Menu we shared earlier. We didn’t do anything to tweak or adjust the menu. We just booted into a brand new clean copy of Windows 10 and took a snapshot. In the default state on our machine there are 18 tiles. We haven’t moved any. We haven’t modified anything. This is the Start Menu we saw (and, with very minor variation) millions of other people will see. Of those 18 tiles 10 of them are advertisements and/or otherwise monetized. If you count the fact that the OneNote tile prompts you to buy an Office 365 license then 11 out of the 18 tiles are not links to useful system functions or apps but some form of promotion. Lady Gaga should only appear in the Start Menu if you put her there. Further, of those 18 tiles five of them, by default, are news (and in most cases that term should be applied lightly). You know what we don’t want? We don’t want a Start Menu that tells us “7 Tips for Handling Hot Summer Hikes”, what’s going on with oil futures, what the current state of the hearing of (insert the name of the most recent domestic terrorist here) is, or how things are going in the NFL. 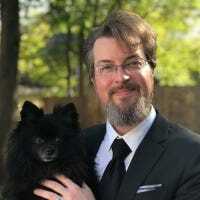 We don’t want burger recipes, tips on clearing brain fog, or suggestions for crap we should buy in the Xbox Live store. When did the Start Menu become a BuzzFeed ad? Further, when we use the search box in the Start Menu we want to search our stuff. Not stuff out there on the web. Not stuff Microsoft wants us to buy from their store. Or, to summarize it succinctly, Lady Gaga should only appear in the Start Menu if you put her there. You’re absolutely right. The biggest complaint we have about the Windows 10 Start Menu could easily and retroactively be applied to the Windows 8 Start Screen. That’s precisely what makes it so unforgivable. Everyone was horrified and offended by how Microsoft took the Start Menu away in Windows 8 and replaced it with a horrible tile interface that looked like a bunch of advertising execs crapped all over it. The crass takeover of valuable screen real estate with blinking ads urging us to buy lackluster games from the Windows Store sat well with absolutely no one when Microsoft rolled it out three years ago. The fact that they stuck with the whole Internet-vomiting-into-your-Start-Menu theme despite the negative response it got in Windows 8 either means they’re greedy and want a slice of the advertising pie or they’re in such desperate need for a slice of that pie they’ve resorted to this. Ironic search results are, well, ironic. As if that wasn’t bad enough, letting the Internet leak all over your Start Menu, the search terms you put into the search box in the Start Menu system are sent to Microsoft’s servers so that they can be analyzed and Bing search results can be served up to you. Honestly, is nothing sacred anymore? For over a decade that search box has returned file results on your personal computer and now it phones home with whatever you type into the box and churns out search results to entice you to get on the web? It’s a hot mess of privacy and ethical concerns. Ultimately it’s completely unforgivable. You can put ads on free mobile games. You can put ads on websites that are supported by ad dollars instead of subscription fees (like we are here at How-To Geek). You can put ads in newsletters. You can put ads in search results. Fine. Ads keep the Internet free and give us access to content we can’t or do want to pay for. But ads in Windows? In the core of the personal computing experience? Furthermore those ads and suggested pages are served up by essentially mining our personal data and search queries which should be private? Unacceptable on every level. What should happen is Microsoft should quietly ease off with the heavy handed and intrusive takeover of the Start Menu. All those early Windows 10 adopters should wake up one morning in the not-so-distant future and thinking, “Huh. The Start Menu looks really good today,” and that would be that. Realistically, they aren’t going to change the Start Menu. They’re committed to the idea that the fundamental interactions you have with Windows should be monetized in this click-here-for-subscription-games and clickbaity news article tiles. So the onus is on us to tweak the Start Menu into something useable, something free from garbage news, something like it should have been in the first place. The easiest and most immediate thing you can do and is purge the tiles. You don’t need to modify anything, you don’t need administrative access, and you can perform it on your personal and work computer alike. Right click on every tile you don’t want to see (and if you’re as grumpy about tiles as we are that’s all of them) and simply select “Unpin from Start” to banish the tile. It’s a simple but effective trick and one of many useful customization tips and tricks we share in 8 Ways to Customize the Windows 10 Start Menu. There is no good reason to have Bing search enabled. It’s 2015. We all have web browsers. We all know how to open them, select our favorite search engine, and perform a query. We do not need to mix personal file searches and Internet searches in the same messy box. Fortunately disabling it is still an option (and hopefully thanks to privacy laws and such matters it will always be an option). You can search for “search settings” in the search box and disable it in the resulting menu. If you want a step-by-step peek at the process you can check out our article here. Ultimately you might find that even with the tiles disabled and the search system unhooked from Bing you’re not happy with the way the Start Menu functions. You wouldn’t be alone in that and there are some great solutions to help you in your quest for a better Start Menu. The most widely used solution is Classic Shell. It’s been around for years and it can help you rebuild the Windows 10 Start Menu to be whatever you want it to be. You can make it look like the old Windows 7 menu. You can tinker with dozens of settings. You can add, remove, and manipulate it until it’s just like the Start Menu you remember (but even better) and you can do it all for free. Check out how to fix the Windows 10 Start Menu with Classic Shell here. Another popular and Windows-10-centered solution is Start10 from the Stardock company. You can pick up a copy of just the Start Menu app Start10 for only $5 or, if you’re looking for even more system modifications, you can pick up the entire StarDock suite of apps (including Fences, WindowBlinds, and more) for $50. Start10 might be a new product offering but StarDock has been around helping people customize Windows since the 1990s. Is This Really Worth Ranting About? Some of you probably hated the new Start Menu before you even opened this article and now you’re just even more riled up about it. Some of you might not have thought too hard about it prior to this moment and now you realize it is pretty shifty what Microsoft has done with the Start Menu. And some of you probably think we need to chill out and it doesn’t matter. It does matter. It matters because unlike us, the people who read (and even write) tech articles and change the Start Menu when we don’t like the way it looks (or what it is up to behind the scenes) there are lots of people who don’t because they don’t know how, they’re afraid to break anything, or they don’t realize what’s actually going on under the hood of their operating system. The people like our parents (and likely your parents), the people like the millions of office workers who use Windows, the people Microsoft is counting on to just use the system the way it is so they can collect search results, monetize everything (including Solitaire for God’s sake which is now a $10 purchase if you want to play ad-free), and further condition people to accept that it’s perfectly normal for the Internet to leak into the core functions of their operating system. It matters because those people will just suffer through the stupid tiles and the privacy intrusions not even knowing they don’t have to while the rest of us tech types will have long since disabled all that garbage and gotten back to using Windows the way we want to use it. The Start Menu is not for news. It’s not a place to pitch us on a TV show or game. It’s not a place to gather information about us and what we’re searching for. You shouldn’t let it be that on your computer and you shouldn’t let it be that on the computers of your friends and family. The Start Menu was, and should remain, an efficient and well organized place to quickly access our applications, system settings, and documents… and if we want to use that utilitarian power to open up Microsoft Edge to search Microsoft Bing for the newest Xbox Live games, well then that’s our (and your) prerogative to invite all the search result analysis and advertisements into our lives on our own terms.